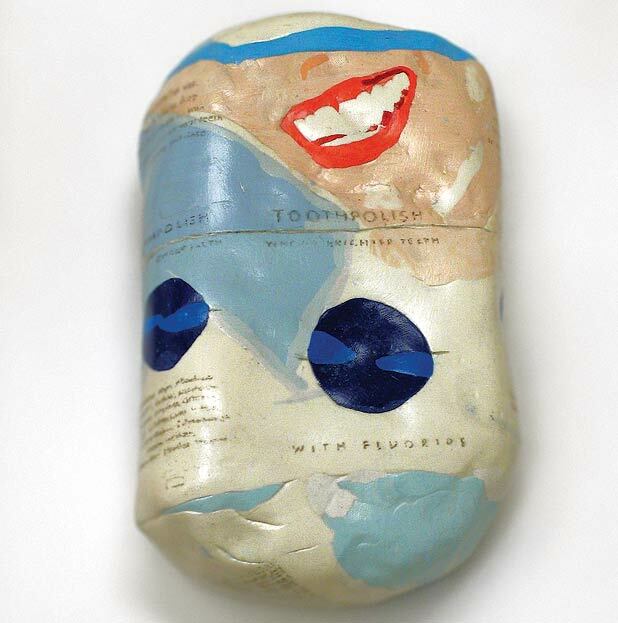 The packaging from healthy breakfast cereals, eye drops, tooth polish and intensive moisturising lotion may not sound like promising subject matter for contemporary art, but Alex Frost's excellent new exhibition consists of works based on just these everyday items. Accompanied by a publication that includes Frost's beautiful 'Blind Drawing' self-portraits and works that further elucidate Compassion Fatigue's sculptural themes, the exhibition features a body of work that is both visually and conceptually intriguing, despite its apparently banal subject matter. 'Adult (Optivita - Berry Oat Crisp)' is the first work to strike the viewer upon entering the gallery. A large, glistening, wall-mounted mosaic made from broken pieces of ceramic tile (as opposed to traditional tesserae), it depicts the front of a box of health-improving cereal, the popular modern antidote to too much good living. It is a striking and colourful piece that dominates the space and maintains an odd attraction, even once the viewer has identified the mundane origin of the mosaic's outsized design. In the next-door gallery, an oversized, bullet-shaped sculpture of simultaneously dynamic and misshapen appearance entitled 'Adult (Optrex - Dry Eyes)' has been similarly decorated with shiny pieces of tile. Like the previous piece, it is strangely beautiful, featuring gentle gradations of colour and clumsily thick stripes of tile at its base, designed to represent a barcode. Alongside these outsized 'Adult' works is a series of smaller pieces depicting boxed products approximately to scale, which the artist has wryly entitled 'Young Adults'. These works, made of polymer clay, accurately represent the packaging of the chosen product, down to the instructions and barcodes. However, each of these pieces is swollen and bulbous, as though they have been squashed and reshaped in transit. Through the representation of these imperfect, branded, over-the-counter products, which are designed to alleviate our minor, cosmetic ailments or prevent future ill health, Frost identifies a bourgeois aspirational intent lurking behind the purchase of these items. Compassion Fatigue successfully challenges the viewer's preconceived ideas relating to the reassuring nature of health and lifestyle 'medicine' and calls into question the cultural and class aspects of their consumption. The London-born and Glasgow-based artist displays some of his sculpture and mixed media work in conjunction with the new publication on his works, 'Supplements'.